NHL News : Kane finally explains why he waves smelling salt at his eyes! Kane finally explains why he waves smelling salt at his eyes! Just more proof that hockey players are a different breed! Smelling salts. We see then often at the start of the game as NHL players are doing everything they can to be pumped for the contest and ready for action. Chicago Blackhawks insider Mark Lazerus of The Athletic wanted to know what it felt like to use smelling salt. He had heard players describe the sensation, but wanted to know first hand what it felt like. It didn’t make sense to Lazerus, so he had a try and realized it would clear any stuffy nose instantly. “It’s like Vicks Vapo-Rub, only on steroids,” he writes. However, he was quick to state that he would never wave them in front of his eyes like Patrick Kane does. And so, he had to understand why the Hawks star player feels the need to do it. 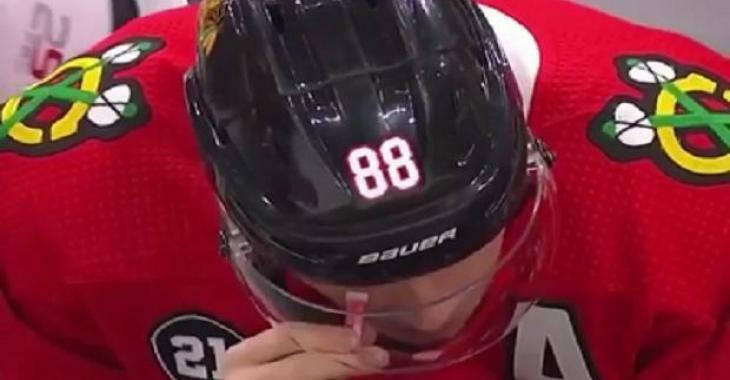 Former Blackhawks forward Artemi Panarin is the one who introduced Kane to smelling salt, however, the latter is the only one using it with his eyes. His teammate Murphy doesn’t get why he does it. You have to read Lazerus' experience, by clicking here.